Two weeks ago, the Creation Museum — the anti-evolution themepark run by the advocacy group Answers in Genesis — received a huge gift: a $1 million dinosaur skeleton meant to help the museum illustrate its belief that dinosaurs were part of the original creation 6,000 years ago and coexisted with humans until well after Noah’s flood. But the Peroutkas’ influence extends far beyond fringe anti-gay, neo-Confederate activism and providing a real-life dinosaur to illustrate made-up science. Through a set of debt-collection businesses, the Peroutkas finance a host of anti-choice groups and promote a troubling Christian-Nation ideology in Maryland and throughout the country. Michael Peroutka, a 2004 Constitution Party candidate for president, is also largely self-financing his campaign for local office in Anne Arundel County. The Institute on the Constitution, according to the group’s website, is “sponsored” by and shares an address with Peroutka and Peroutka, the debt-collection firm Michael runs with his brother Stephen, who was also a co-founder of the Institute. It’s through the law firm and its debt-buying arm, Pasadena Recievables, that the Peroutka brothers finance the Elizabeth Streb Peroutka Foundation, which is named after their mother. From its founding in 2003 through 2012, the last year for which tax records are available, the family’s foundation has been almost entirely financed by grants from the Peroutkas’ pair of debt-collection businesses, along with investment income and a few personal donations from Michael and Stephen. Together, the family and its businesses have put $5.2 million into the foundation over nine years. Its biggest asset, until now, has been the Allosaurus. Ebenezer the Allosaurus was originally dug up in 2002 by a team of homeschoolers led by a conservative Christian family from Florida that ran a business providing anti-evolution excavation adventures. Also leading that expedition was Doug Phillips, a leader of the anti-feminist Quiverfull movement, who is now facing charges of sexual battery and assault against a young follower. Of $3.6 million in grants that the Peroutka Foundation has dispensed over nine years, about one-quarter — $920,000 — has gone to the National Pro-Life Action Center, an anti-choice lobbying group chaired by Stephen Peroutka. (The Center is one of a tangled web of right-wing organizations run out of the same office in Washington). 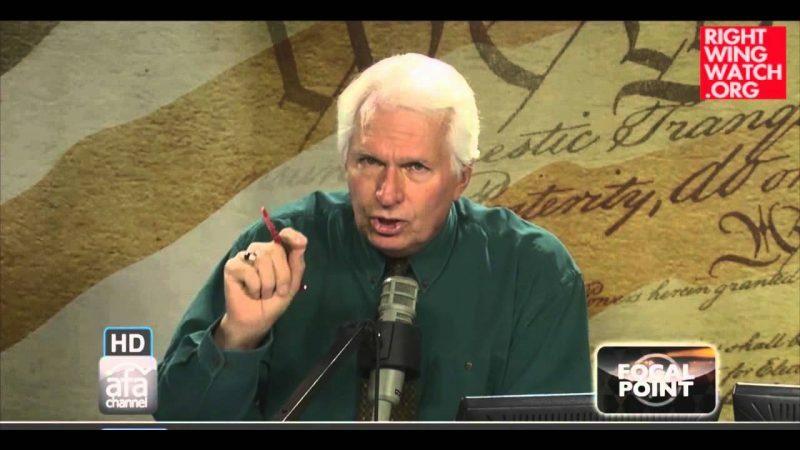 Stephen Peroutka was also the founder of National Pro-Life Radio, a network run out of the same building as the brothers’ law office that aired shows from anti-choice activists including Janet Porter, Jay Sekulow, Frank Pavone, Jesse Lee Peterson, and both Peroutka brothers. The foundation has heaped much of its largesse on Maryland-based abortion clinic protest groups and crisis pregnancy centers, including contributing a total of $236,000 to the Baltimore-based abortion clinic protest group Defend Life, perhaps most infamous for organizing a protest outside the middle school attended by the daughter of an abortion provider’s landlord. And although anti-choice groups have received the bulk of the foundation’s grants, it has also taken on some other causes close to Michael Peroutka’s heart. Most notably, the foundation has contributed tens of thousands of dollars to groups associated with Alabama Supreme Court Chief Justice Roy Moore, one of the nation’s loudest proponents of Christian Reconstructionist ideology, who shot to fame in 2003 when he was ousted from his original position on the state supreme court for refusing to remove a statue of the Ten Commandments from his courthouse. 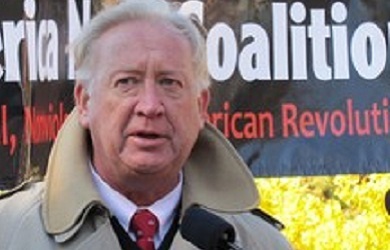 In 2004, after the far-right Constitution Party failed to recruit Moore to run for president, Peroutka took his place as the party’s candidate. That same year, the Peroutka Foundation spent $120,000 bankrolling Moore’s nationwide speaking tour “regarding morality and the Ten Commandments” and gave $12,000 to the National Coalition to Restore the Constitution, a group that organized rallies backing Moore in an effort drum up support for a measure preventing federal courts from hearing many church-state separation cases . In addition, the Peroutka Foundation has contributed a quarter of a million dollars to the Foundation for Moral Law, the group that Moore ran before returning to the Alabama Supreme Court, and which is now run by Moore’s wife. 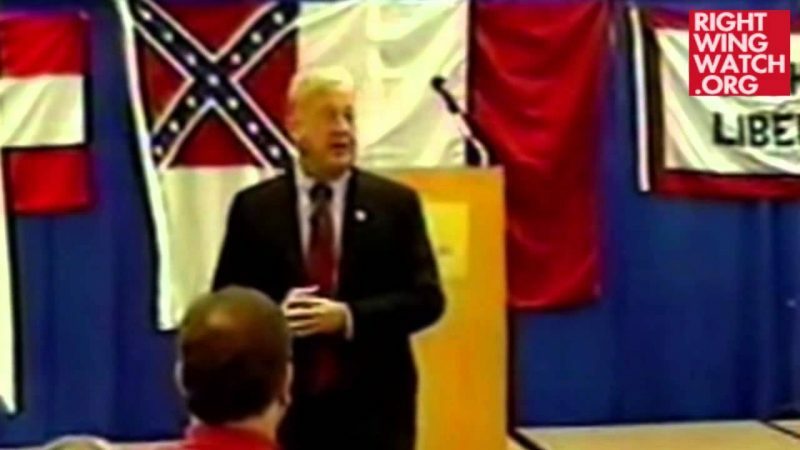 Under Moore’s leadership, the Foundation for Moral Law hosted a neo-Confederate “secession day” event, and the group employs John Eidsmoe, a Michelle Bachmann mentor who has white supremacist ties. One of Moore’s activities at the group was representing protesters who had disrupted a Hindu opening prayer in the U.S. Senate. “It’s a shame that not one U.S. Senator stood up to defend a tradition that goes back to the very first Continental Congress of acknowledging the one true God of the Holy Scriptures,” he lamented. The next year, when Moore successfully ran to reclaim his seat on the state supreme court, Peroutka provided the bulk of his campaign chest. While anti-choice groups and Moore have been the biggest recipients of the Peroutka Foundation’s generosity — at least until Ebenezer moved into the Creation Museum — the foundation has also offered smaller grants to a smattering of extremist ministries and Confederate history enthusiasts. The Peroutkas are also frequent donors to state and local campaigns. According to Center for Responsive Politics data, Michael, Stephen and Stephen’s wife Deborah contributed $35,900 to their congressman, Rep. Andy Harris, between 2007 and 2011. Not the least of the beneficiaries is Michael Peroutka himself, who has lent $30,000 to his own campaign for Anne Arundel County Council, about half of the $62,000 he has raised so far. His political ambitions may continue to run higher — it was rumored that he considered running for state attorney general this year before setting his sights on the county council. Peroutka’s web of influence shows that he is more than, as one libertarian scholar put it, a “wackypants anti-gay crusader.” Peroutka’s activism and philanthropy illuminate the connections between the Creationist movement, the Christian-Nation philosophy of people like Judge Moore, anti-choice agitators, fringe anti-gay extremists like Daubenmire and Klingenschmitt, and the network of Confederate nostalgists that can never quite hide its racist roots. All are striving for a biblical and constitutional purism that exists only in the minds of those who adhere to it, and a return to an imagined past where dinosaurs stowed away on Noah’s ark, the Constitution mandated an exclusively Christian nation, and the Civil War didn’t turn out quite right.